Ammonium sulphate differs from other nitrogen fertilizers in that it contains sulfur. Sulfur has an important place in the life of the plant. It is the leading nutrient element after nitrogen, phosphorus and potassium. Ammonium sulphate as fertilizer, frequency remains underestimated because the magnitude and quantity of vegetable production are not affected. But this fertilizer has a great influence on the quality of vegetables. Sulfur is part of proteins, this element is present in the essential amino acids and vegetable oils. Sulfur activates enzymes in protein metabolism and regulates the redox processes occurring in plants. Sulfur disrupts nitrogen metabolism, delays the synthesis of proteins and amino acids. Plants slow growth, elongated stems, leaf size decreases and they become pale in color. The best source of filling in the lack of sulfur is ammonium sulfate. In addition, this fertilizer is cheaper. If we assume that the units of the active substance, the cost of nitrogen consisting of ammonium sulfate two times lower than its value in the urea or ammonium nitrate. Ammonium sulfate is used on all types of soils, but acid soils should be carried out liming. Used to different cultures. It's grains and oilseeds, root crops, vegetables and melons. The required ammonium sulphate cabbage, potatoes, beets, carrots, sunflowers, tomatoes, pumpkin, watermelon, radish, garden radish, turnips, courgettes, sorrel and parsley. Also, ammonium sulfate is good to fertilize gooseberries and raspberries. Ammonium sulphate – mineral nitrogen-sulfur fertilizer is a bright salt crystals are a pinkish or yellowish color, which are readily soluble in water. It can be stored for five years, is not explosive and is not hygroscopic. The nitrogen contained in ammonium sulfate in the ammonium form, is completely absorbed by plants and not washed out of the soil. 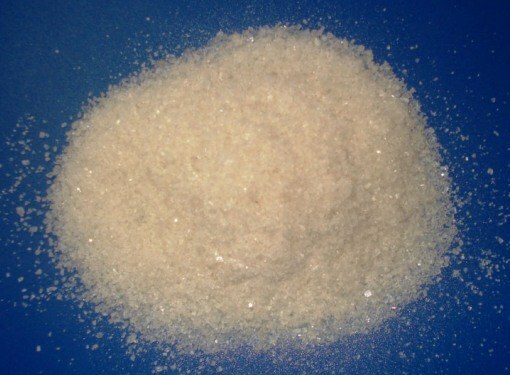 Ammonium sulphate is used as a base fertilizer. On heavy soils to fertilize them in spring and autumn. But the best results fertilizer shows when you make a spring digging the soil. One of the most effective methods of application of ammonium sulfate is introduced into soil mixed with chalk or ground limestone and 1.2 kg of chalk per 1 kg of ammonium sulfate. In the vegetation period the plants can be fed with a solution of ammonium sulfate or add it to liquid nitrogen fertilizer. – gooseberries and raspberries – 50-60 g/m2. Ammonium sulphate should not be mixed with ash and slaked lime, but to all other fertilizers.